A girl can have so many products in her skincare routine – it can be a soap from a drugstore brand to a mask made from caviar. One thing is for sure, no matter how simple or luxurious ones skincare kit is, there will always be a facial wash in it. Here in the Philippines, Pond’s is undeniably one of the biggest and most popular providers of our fave skin care products. The reputation of the brand is absolutely remarkable! 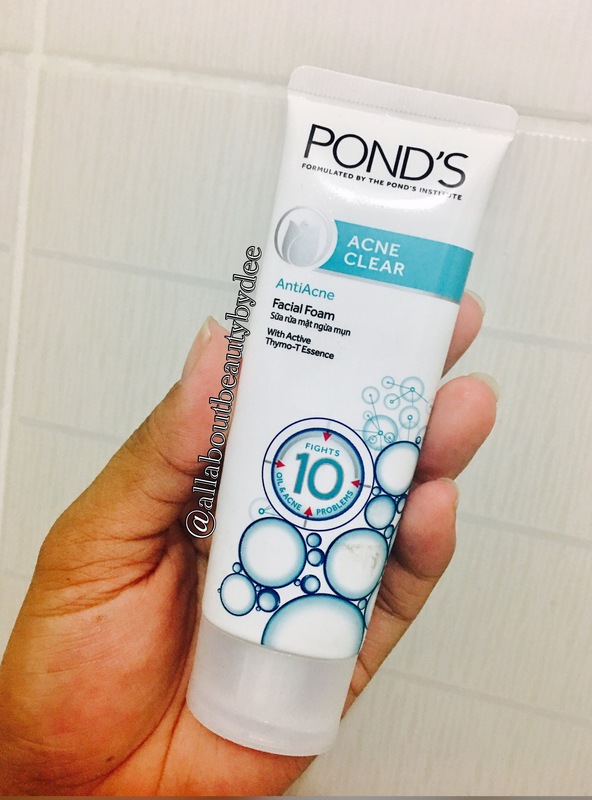 Not too long ago, Pond’s launched their Acne clear collection which includes their Acne Clear Facial Foam and Gel. I will be posting a separate blog for the gel. Formulated with the world’s first Active Thymo-T Essence, Pond’s Acne Clear uses unique Lock + Clear Technology that works in 3 days to eliminate acne at the root. I was having issues with breakouts when I purchased this. I was a bit skeptical of their claim that says pimples will disappear after 3 days but I thought of giving it a shot. It is inexpensive and I needed my pimples gone so, I threw it in my shopping basket. 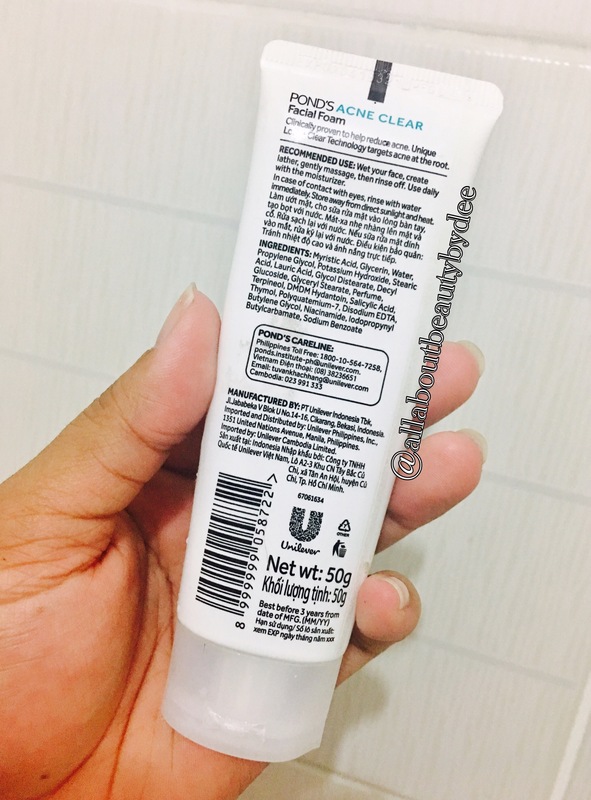 I completely forgot how much this was when I got it from SM supermarket but I am 100% sure that I didn’t pay more than P100 for the 50g tube. Zalora offers its 100g at P155 while Lazada sells it at P140.90. The product is store in an easy to squeeze white plastic tube with a flip cap which you know I love. It’s just way more convenient! Just be careful not to squeeze it too hard to avoid the product from oozing out of the tube and making a mess on the cap. Nothing so fancy about the design. Pond’s kept it simple this time yet its color combination screams freshness. Press the tube lightly and the face wash will come out on your palm. Dilute the face wash with water to spread it easily on face. Now, let the face wash sit on your face for some time at least 5-10 minutes. Rinse your face with water. Pat it dry. The texture feels like a typical facial foam. A little goes a long way; just dispense a small amount of product and dilute it with water. Then, spread it on your face. I enjoyed the foam big time but I didn’t really feel the beads they were talking about – both when I swatched it on the back of my hand and while gently rubbing it on my face. +not drying at all so this could work for oily, dry and combi skintypes. Tip: After gently massaging the product on your face, leave it there for 2-3 minutes especially if you have active pimples. This approach confirmed its claim. I noticed that my pimples looked a lot smaller and dried faster. Would I repurchase? Yes! Without a doubt! Previous Post Toner for oily skin! Thanks! I noticed that I haven’t getting any improvements from this product and I was thinking if I should stop it or not. But I would try your recommendation to let it stay for 5-10 minutes.